Current RPA CASA Laws and Regulations for Hobby and Recreational Flyers. When we fly commercially we always get asked questions regarding Australian drone laws for recreational users. CASA has setup a user friendly website which explains the rules and regulations. We suggest you check this website before flying your drone. I’ve written this article to expand a little on these rules and clarify some questions we get asked frequently. Note: This article has been written specifically to assist recreational users. As you know I'm the Chief Remote Pilot and commercial drone operator at Bendigo Aerial. We follow the same rules however we have permissions, permits and approvals to fly outside of these regulations. We are governed and audited by our ReOC (Remote Operator Certificate) which may exclude some of these drone laws and regulations. I will shortly write an article only for Commercial Drone Operators. Important before flying download the CASA “Can I fly there?” Drone Safety App. For recreational users, this is a great app which explains Australian drone laws and shows the location where you can and cannot fly. The app also identifies restricted zones, airports, helicopter landing sites, public safety issues, disasters and approach/departure areas of airfields. The app is free and can also be viewed directly from your internet browser. As a recreational user, you can only fly your drone during daylight. This means between sunrise and sunset. Once the sun has set, the pilot must land their aircraft and/or not take off. Night flying is strictly prohibited for all recreational drone flyers. Terminology: BOD stands for Beginning of Day, EOD stands for End of Day. It’s against the law to fly over any person. This rule expands to local parks, sporting events, ovals where there is a game on and includes populous area. Definition of populous: The area where you are flying has sufficient density to people, cars, buildings, events etc. While you are not permitted to fly over people, you must keep your drone at least 30 meters away from people. This includes property such as parked cars, foot traffic, moving vehicles, infrastructure such as a railway. You must always be able to see your drone with your own eyes. Without the aid of a phone/tablet screen or the use of FPV (First Person View) goggles. If your drone is out of sight or too far away, then you’re BLOS – (Beyond line of sight). Drone Laws in Australia only permit for a visual line of sight. You must not fly your drone near a current emergency. Example car crash, rescue, fire, bushfire, police operation. For larger incidents, the CASA app will indicate a red circle around the incident. The restricted area is removed once the incident is clear. You can also check on the Victorian Emergency website. 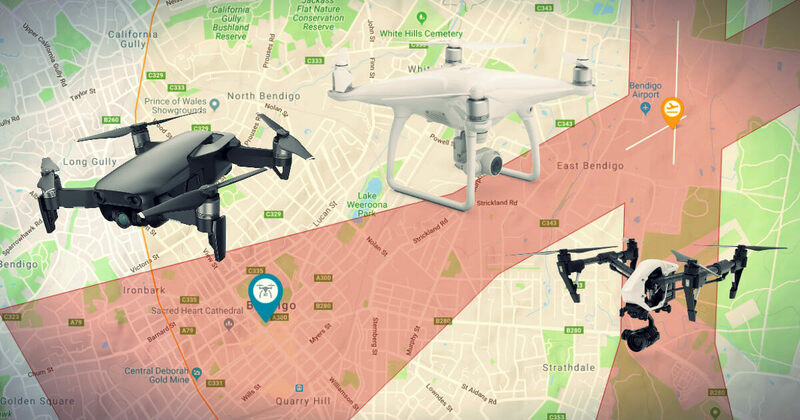 If your drone weighs more than 100grams, you must stay away at least 5.5KM (3NM - Nautical Miles) from a controlled airport (Example Melbourne, Essendon, Avalon, Moorabbin Airports). When the airport is listed as uncontrolled example Bendigo Airport, you may fly inside the 5.5KM radius (3NM - Nautical Miles) only if you know that no aircraft are taking off and landing from the uncontrolled airport. When you see or hear an aircraft while inside the uncontrolled zone, you must land immediately and not take off. This is a restricted zone and flying is strictly prohibited within the approach and departure of an uncontrolled and controlled airport. The approach and departure lanes span 15 degrees up to 7KM from the airport and are visible on the CASA App. The zone is highlighted in red (restricted) as manned aircraft maybe be making their approach or taking off. Manned aircraft may be flying under 400FT. Different states have different laws regarding privacy and photography. As a rule, don’t photograph anyone without their consent. As a recreational user, you are required to respect public privacy by not photographing people. If you are concerned about drone privacy you can contact the Office of the Australian Information Commissioner. Not sure how anyone can fly multiple drones at the same time. This drone law is exactly what it states. Only fly one drone per person at any one time. You can own multiple drones, just fly them one at a time. This section highlights some drone laws that many recreational users don’t know. They range from rules that affect your local state to conservation and environment. There are safe distances and approach limits to keep from whales, dolphins and marine animals. You can read more about The Australian National Guidelines for Whale and Dolphin Watching. You may think this is a joke, however, fines range from $500.00 to $100,000 per offence. Play it safe, don’t fly near protected marine life. I recently wrote a detailed article about Parks Victoria and drones. Recreational drone use is prohibited in all state parks, national parks and reserves across Victoria. Across Australia each State Park authority will have their own rules and regulations for taking off and landing in managed park land. Within Australia, there are several permanent no-fly zones where flying a drone is prohibited. Example ALL correctional facilities, Sydney Harbour, military locations (example Point Cook), some telescopes and satellite stations, private contractors and science facilities. Check the CASA App for more details. Drone laws prohibit recreational drone operators from using drones for business/commercial use. This includes creating content for websites, social media, real estate and commercials. However, if your drone weighs under 2KG you can apply to CASA to fly commercially (Sub 2KG Class). You must inform CASA at least 5 days prior to flight, have an aviation reference number (ARN) (free to apply) and fly using the above rules. Note without the correct paperwork, fines do apply. Although it’s not a drone law, it’s always good to have a spotter on your side. The spotter can keep an eye on the drone or look out for hazards while you fly. Or you can take turns flying if you are with a friend. Final drone law – USE COMMON SENSE! Yes I know I had to say it. All these rules and regulations are just common sense. They are in place to keep people on the ground and in the air safe. By respecting these drone laws you’re keeping the industry safe as well as promoting drone safety to others. If you require further information or want to add information I may have missed in this article, please contact me. Safe flying and have fun flying drones.